"We didn't think it would make it through the week," Nuckols said. 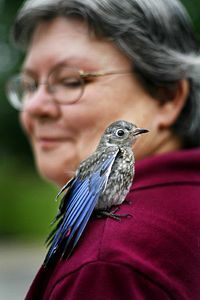 Nuckols said she did some research on the Internet and found that rescued bluebirds typically fly away in 19 days. Birdy was found on Mother's Day, 40 days ago. The chatty bird has yet to fly more than 25 feet before swooping back around and chirping on either the Willards' or Nuckols' shoulders. According to Dave McRuer, director of veterinary services at the Wildlife Center of Virginia, rescued songbirds like Birdy don't typically "imprint" with humans. He said it is possible at a very young age for the bird to think it is a human or that the humans are birds like her. McRuer added that keeping a bluebird without a permit for scientific or educational efforts is illegal and against the Migratory Bird Act. But the Willards said they try to get Birdy to fly away every day. Until she takes flight, Birdy seems content hopping around in a strawberry box, which holds baby mealworms (she eats about 50 a day), bird seed and the fish worms that Nuckols' husband, Fred, digs out of the backyard. In the evening, Birdy joins Doug Willard on a rocking chair to watch her favorite show, "NCIS." So that Birdy can enjoy watching her show in peace, the Willards' three cats -- Baby Socks, Goofy and Dude -- are lured away. The cats were also adopted, but unlike Birdy, they will enjoy the Willards' hospitality for life. "It would be sad [for her to fly away]," Diane Willard said, "but we know that she's a bird." Source: Tim Chapman, Richmond Times-Dispatch, Va. Your blog is always such a great source of strength and positivity. I wanted to let you know that I really appreciate what you do! !